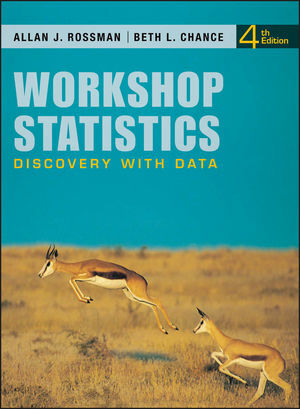 Allan Rossman's 4th Edition of Workshop Statistics: Discovery with Data is enhanced from previous issues with more focus and emphasis on collaborative learning. It further requires student observation, and integrates technology for gathering, recording, and synthesizing data. The text offers more flexibility in selecting technology tools for classrooms primarily using technologies other than graphing calculators or Fathom Dynamic Data software. Furthermore, it presents more standards for teaching statistics in an innovative, investigative, and accessible as well as provides in-depth guidance and resources to support active learning of statistics and includes updated real data sets with everyday applications in order to promote statistical literacy. TABLE II Standard Normal Probabilities. TABLE III t-Distribution Critical Values. TABLE IV Chi-Square Distribution Critical Values. APPENDIX B Sources for Studies and Datasets. APPENDIX C List of Data Files and Applets. New end-of-unit online lab activities/case studies incorporate technology and introduce students to concepts of statistical inference early and repeatedly throughout the course. Twenty percent of the in-class activities have been revised and/or updated based on instructor and student feedback. In general, the same concepts and methods are introduced but with different datasets. Datasets have been updated throughout the text to be timelier. Homework activities are now labeled as exercises. Approximately 25% new exercises have been added throughout the text. Introducing each topic, preliminary questions requiring the collection of student data are now listed under a separate sub-heading. In addition, activities that revisit the issues raised in the preliminary questions are now highlighted. To help students better understand (and use) the applets, screenshots have been annotated with explanations and guidelines. Learning objectives are summarized at the end of each topic with references to associated activities. Relevant photos have been added throughout the book. In order to improve navigation, the design of the book has been significantly revised. Specifically, the Watch Out feature and the Self-Check Activities have been re-designed to better draw students’ attention. Activities utilize the principles of student engagement and active learning and place stronger emphasis on developing students' conceptual understanding of key statistical ideas. Focus is on real, genuine data that students generate themselves to teach the real-world relevance of statistics. Teaches and requires group work, student writing and communication, and problem identification and solving. Models the philosophy and conforms to the research conclusions of two important sets of studies and recommendations: Garfield's "How Students Learn Statistics" and the "GAISE Guidelines"